Santorini’s mayor has pledged to improve the conditions for working equines on the Greek island following a welfare assessment by international charity The Donkey Sanctuary. A team from The Donkey Sanctuary and its partner Greek Animal Welfare Fund/Animal Action Hellas (GAWF) was on the island from August 19 to 25 assessing the welfare, working conditions and socio-economic value of the donkeys and mules on Santorini. In general, the body and hoof condition of the equines was found to be largely good but all parties acknowledged there are areas requiring improvement. 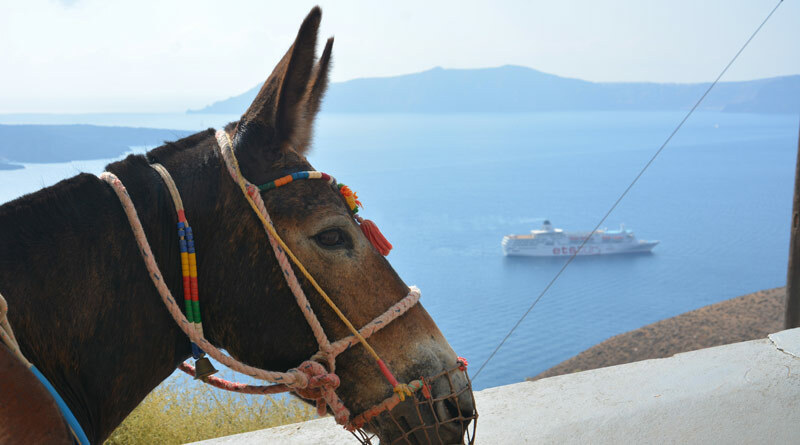 Representatives from both groups met Santorini Mayor Anastasios-Nikolaos Zorzos late last month to discuss improving the key areas of concern around the working conditions of the donkeys and mules on the island. During the meeting Zorzos confirmed his commitment to improving the key areas of concern identified by the two charities. The mayor pledged that all of these improvements will be implemented in time for the next tourism season on the island. The Donkey Sanctuary and GAWF will monitor progress in follow-up visits. The Donkey Sanctuary and GAWF recognise that donkeys and mules form an important part of the social, cultural heritage and economic foundations in Santorini and are keen to encourage visitors to make an informed decision about their suitability to ride an animal as well as the suitability of the animal to be ridden. UK-based Greek Animal Welfare Fund (GAWF), operating in Greece since 1959 as Animal Action, Hellas, has been working in partnership with The Donkey Sanctuary to deliver an Equine Outreach Project in many regions of Greece. Its Equine Project aims to improve the lives of working equids, and focuses its efforts mostly on island communities, rural and/or isolated areas where owners have little or no access to trained professionals and where traditional practices that can be either ineffective or positively harmful are still widespread. This project is unique in Greece in delivering not only treatment and care but, crucially, in adding to the knowledge and skills of local owners; building their capacity to look after the animals on which they rely after the team has left the area.